Welcome to the FDA. As a Food and Drug Administration agent, it's our job to investigate food-related crimes. From deep-fried fingers to murdered mascots you'll need to enlist help from the likes of Tony Chu, Mason Savoy, Poyo, and more in a fast-paced, high-laughs, take-that card game designed by Kevin Wilson (Arkham Horror, X-Files, Descent). 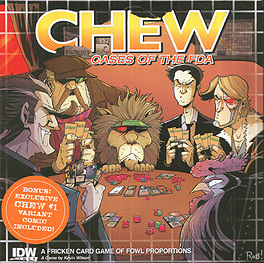 In CHEW: Cases of the FDA, you'll work to solve a case pulled straight from the pages of the Eisner Award-winning comic series. Whether it's finding clues, recruiting allies with amazing food-related super powers, or sabotaging your opponents, each round you'll work to close the book on your particular investigation before your opponents can swoop in and steal your spot as the top-food-cop in town. And the best part? The box is chock-full of CHOGS (Half-chicken, half-frog, all-adorable)!